As you may have guessed, I make a LOT of desserts before Josh goes to the field. My wonderful husband, Josh, gets a wee mite of a sweet tooth when he takes part in the military’s idea of camping (only without the marshmallows or pancakes). I just adore that man so how could I deny him cookies, crisps, and pie? 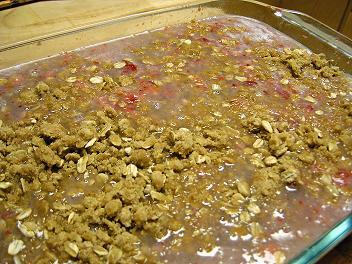 Combine the crumble ingredients in a bowl (place 2 tbsp. 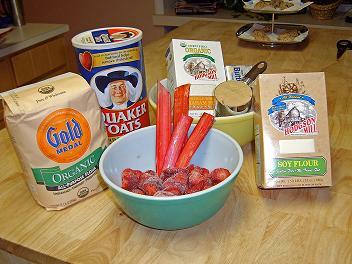 soy flour in the bottom of your 1 cup measuring cup and then add the flour over the top — for each cup of flour). 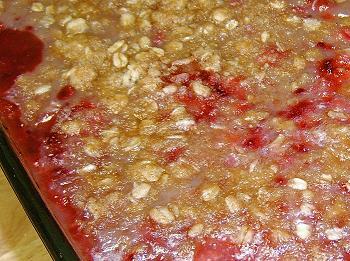 Press half of the mixture into a grease 9×13″baking dish. Preheat oven to 350 degrees Fahrenheit. 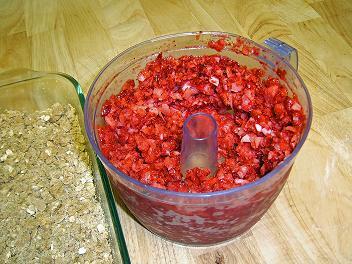 Top the crumble with chopped strawberries and rhubarb (mixed together). Gaze lovingly at that color. I know that I am. Stir together cornstarch and sugar, then place the mixture in a saucepan. Pour water over the mixture and whisk. Cook until thickened and pour over the fruit. 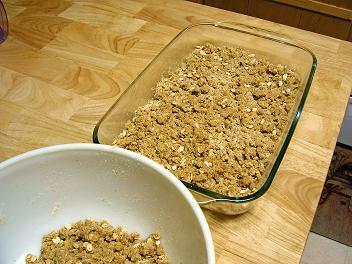 Sprinkle the other half of the crumble over the top and bake for 45-55 minutes, or until golden brown. Allow to cool a bit — it will be bubbling when you take it out of the oven. I like mine still a bit warm with vanilla ice cream (or frozen yogurt) but Josh likes his completely cooled and cut into bars. Whatever floats your boat, folks. It’s a really tasty treat and fills your whole house with such a fabulous scent. Sigh. Heaven! *Can use all-purpose instead… but then it wouldn’t be sneaky. Want to know more about rhubarb? Click here and read all about it. Judy - That’s look yummy, but don’t I see some oats in there? Thank you for your sweet words in my comment! 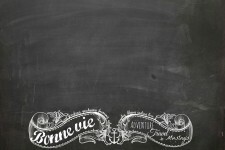 I really enjoy blogging and I have you to thank for that. I think you should do one of those “get to know you” kinda list like mine. You can even just copy it from my blog. It would be so fun to read more about you. Paula - Mmmmmm……I’m on my way to your house! Lucy - We LOVE rhubarb stewed, in a pie, as a crisp, warm over ice cream or in jam. I was raised on it. I took a crisp as a gift and insulted the host because he said it was known as “the poor man’s dessert.” So, I gladly took it back home with me. We like it straight up, no berries, just cooked with sugar and a little thickening.